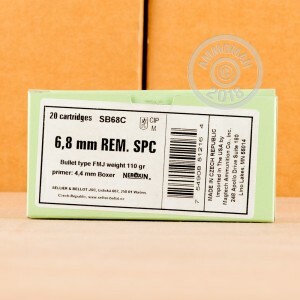 The 6.8mm SPC is one of the alternative chamberings for the AR-15 platform and can sometimes be a bit expensive. 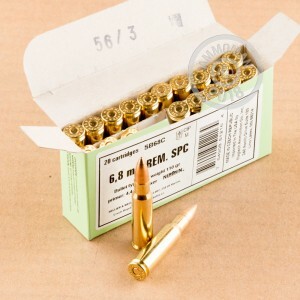 Fortunately, S&B has picked up the cartridge and is offering this high performance, low cost ammunition. Each round in this box of 20 fires a 110 grain full metal jacket bullet at a muzzle velocity of 2,549 feet per second. These cartridges are made in the Czech Republic using non-corrosive Boxer primers and brass cases. Shop at AmmoMan.com to keep your per-round costs down. All orders over $99 ship for free! Ammo worked fantastic to start the break in of my new rifle.